Lo and behold, here comes the most obvious place for getting backlinks possible. It’s about time, wouldn’t you say? Anyway, for those of you who don’t know, social bookmarking sites are places where you can store your bookmarks online (at least that was the original idea). The main benefit here is that you can access them from any location because they are not kept locally in your browser. Additionally, most sites offer an extensive category and tag features, so you can organize your bookmarks pretty neatly. If you hop on to my Delicious profile you will see that there are 917 links there at the time of writing this (well, actually there are 1507 links, but 590 of them are private). As you can see I’m a fairly active Delicious user. And it should be obvious that I’m not using it purely to get backlinks. Adding links to these kind of sites is very easy, and over the years a lot of people have been using these sites exclusively for link building, creating hundreds of accounts and thousands of links every day. At first, this was an effective link building technique, but quickly the space became so saturated that Google caught on to that and it lost nearly all of its effectiveness. How to use social bookmarking sites for link building? So is there even a point in using social bookmarking for link building these days? First of all, there’s still a point in using social bookmarking for its original purpose – to store your bookmarks online, but some link building benefits can be seen as well if you do the whole thing right. Nowadays, most social bookmarking sites ban accounts that are bookmarking just one single site, or a small range of sites. So if you’re just going to submit links from your own site, eventually, you’re going to get banned. In order to use social bookmarking sites as link building venues in any way you have to build a naturally looking profile containing links to different websites. I don’t actually know the exact definition of a “naturally looking profile,” or how many links from one site is too many because I haven’t done any study around this, but it’s always good to use your own judgment. What I would advise is to not link to your own site more than once in every ten other submissions. This may sound like a lot of work, but with a good approach it isn’t. You just simply have to use these sites like you naturally would. Every time you stumble upon an interesting site or a post just bookmark it, so when the time comes to bookmark your own site you’ll have a well set up profile waiting for you. What is the value of all this? Not particularly big, I’m afraid. Sorry, but I want to be honest. Times when social bookmarking would skyrocket your site to the top of search engines are long gone. Nowadays, you should only treat it as a supplemental technique. Treat it like a technique to build links to your other online real estate – like ezine articles, free blogs, web 2.0 sites and so on. In this way it actually works. Now the best part is that the more websites like these you have the less you have to worry about your profile looking genuinely. That’s because it automatically will be, due to the big variety of sites bookmarked, regardless of the fact that they are all yours. The fact about link building is that no one particular technique is going to be a magic bullet. If you do just article submissions, or just web 2.0 sites it’s not going to get you far. What works is variety. Sites that sit on top spots in Google are ones with big backlinking profiles consisting of many different sources of links. Social bookmarking is an important part of this. You see, it’s natural that a popular site has a big number of bookmarks. If it doesn’t it just looks suspicious and sends contradictory signals. For example. If a site has 1,000 links from article directories, 10,000 bookmark links, 800 links from blogs, 100 links from YouTube, etc. then it looks genuine. But if the site only has 1,000 article directory links then it’s kinda suspicious. So in essence, the value of social bookmarking lies in its ability to make your backlinking profile complete. There are many social bookmarking sites on the internet, so you can go as big or as small as you like. But obviously the more sites you choose to use the more work it’s going to require. 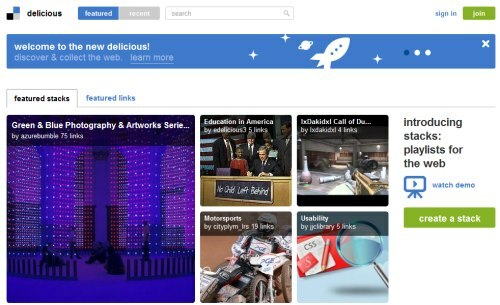 Delicious is a good place to start, as it’s one of the biggest and most respected social bookmarking sites. Then you can expand once you get used to how this whole thing works. There are Delicious plugins available for all major browsers, so you can submit bookmarks straight from your browser’s window and don’t have to leave the site. This makes the whole thing a lot easier and quicker. If you want to use more sites at a time manual submissions might not be the best idea. Thankfully, there are some automated and semi-automated services (some paid). For example: BookmarkingDemon, IMAutomator.com, SocialPoster, SocialMarker.com. Truth to be told, the more high profile SB sites you use the more natural your backlinking profile looks like. But it’s up to you to draw the line somewhere and decide how many sites is enough. Overdoing it isn’t good either. There’s only one leader on this list. If you do nothing else sign up for a Delicious account and check out what it has to offer. Leaving all link building factors behind, it’s a great tool for keeping your personal bookmarks online. Is the series over yet? No, it’s not. Still more places to get backlinks coming your way soon. Feel free to subscribe to my RSS feed or email updates to get the posts delivered to you the minute they are created. Lastly, don’t hesitate to shoot me a comment if you know more quality social bookmarking sites that would be a good fit for this list.